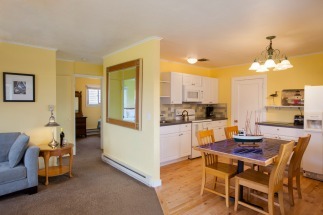 This two-bedroom cottage is located at our Sea Sprite at Haystack Rock Hotel. This cottage is like having your own private beach house. Located east of the Sea Breeze Cottage, this cottage offers partial ocean views as well as views of our lovely gardens. The unit features a sunroom with partial ocean views, perfect for enjoying your morning cup of coffee or tea while gazing into the horizon. Right outside your door is a lovely courtyard with a picnic table for dining al fresco. A few steps beyond that are the ocean front lawn and stairs to the beach. Perfect for the whole family, the Blue Heron Cottage has a queen-size bed in each bedroom and a full-size sofa sleeper in the living room. Sleeps 6 people. 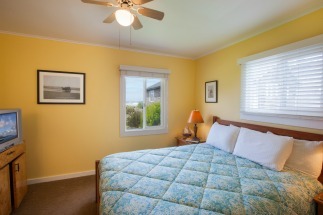 This partial ocean view cottage offers views of the Pacific Ocean and our lovely gardens. Our quiet location south of Haystack Rock provides a peaceful retreat for those looking for a place to replenish and renew.